Learn the basics of how to mulch your trees properly below! Now that you have gotten started on your spring tree and lawn care, there’s probably a bag or two of mulch sitting on your deck awaiting distribution If you are ready to start mulching your trees but not sure how to tackle the task, here are some of our best tips on the right way to mulch the trees in your yard. If you have compost to spread around the base of a tree, take care of that before worrying about mulch. Spread your compost around plants and trees and let it work into the soil after a rain or thorough watering. Wait at least a day to apply mulch in the appropriate quantities. How Should I Mulch My Tree? Use two to four inches of mulch for each tree in your yard, layered around the base. 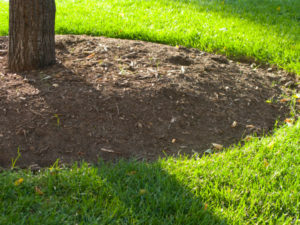 First, spread a single layer of mulch around the direct base of the tree. Next, use a shovel or rake to slowly and evenly spread the mulch out to the edge of the tree’s canopy. If you aren’t sure when to stop, do this task when it’s shady so that you can clearly see the edge. When mulching your tree, keep in mind the trees that you see throughout nature every day. Healthy trees in the woods are not covered up to their necks in mulch. Instead, they have a healthy base surrounded by natural mulch and plenty of truck exposed. Keep the tree root flare free from mulch and only put 2-4 inches total around the base. Volcano mulching (piling up mulch high around the base) only attracts fungus and disease to your trees. This entry was posted on Wednesday, April 12th, 2017 at 1:29 pm. Both comments and pings are currently closed.